Starting from Haslar Marina early, rally boats have a full day’s sail for the 70 mile passage to Cherbourg. This is one of the longest and busiest legs of the rally, with heavy commercial traffic in the Channel's shipping lanes. 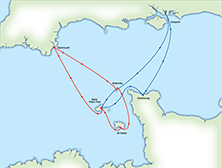 There is no pressure to arrive by a certain hour as Cherbourg is an all-weather port and accessible at any state of the tide. 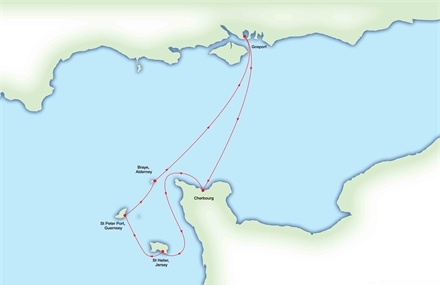 From Cherbourg, the distances between stopovers between 30-60nm; Using the tides to our advantage, the days are planned to combine pleasant sailing with time to explore ashore and meet up with other crews over a rally meal or sundowner on arrival. The return crossing from Alderney is an overnight sail, and crews are welcomed back into Haslar Marina by rally staff whatever time they arrive the next day. Skippers' Briefing, safety checks, seminars, ready for an early start. Duration 10 days. 2020 itinerary will be availble when rally opens for registration. ARC Channel Islands participants (the skipper and at least one crew member) are recommended to attend the comprehensive Preparation Seminar held at the Hamble School of Yachting in May 2020. 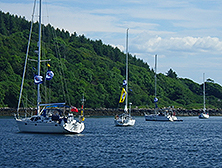 The seminar will be an ideal opportunity to see how your preparations for the rally are progressing, with plenty of time still available to take on board tips and advice from experienced cruisers. The seminar also provides an opportunity to meet your fellow ralliers! Time to socialise with other crews is planned during the day, and the World Cruising Club team will be available to answer any questions you may have. More details about the programme will be available on the website and in the newsletters leading up to the seminar.